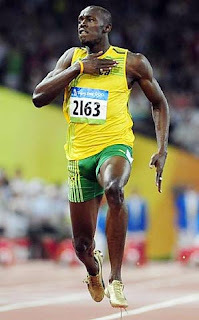 I remember Usain's Bolt shove to glory. He is FAST! No doubt about it, however what I cannot stand is a boastful man. He never took anything with grace or humbleness. He was always lauding it over everyone else and getting on way over the top. I don't like that. You win, it's great to celebrate, but don't forget you have a team and it's ok to show some form of humbleness. So I like that he won for our country, but I simply can't stand the man. Well one day you are up and one day your are down. This rule where it's been changed to one and done is the most unfair I believe. I think there shouldn't be four or five false starts, but we should make it at least two across the field. It's upsetting that athletes train so hard for a moment and aren't given a second chance by this silly rule. All that being said, Usain Bolt is a great athlete. It's wonderful to see Yohan Blake picked up the slack. Might as well grab it while you can eh. Do you watch track &amp;amp; field? I think we should win with humility too. If not for God we would never accomplish anything. I am Jamaican and i feel the same way about Bolt. I am truly sorry about what happened. however, i hope he uses this as an opportunity to reflect. Yes, there's something to be said for humility!! !